Joel Emmanuel Haaglund was born in Gefle, Sweden in 1882. 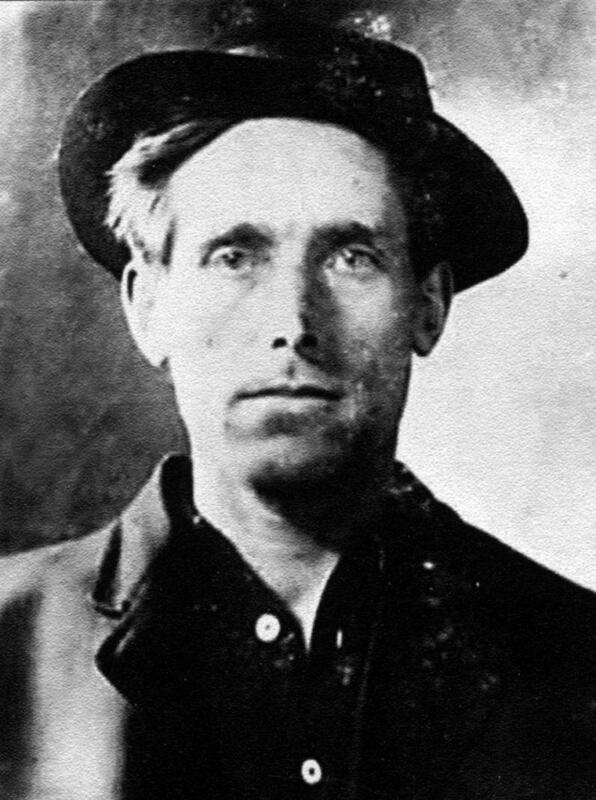 He emigrated to the United States in 1901 and settled in California where he changed his name to Joe Hill. Converted to socialism in 1910, Hill became a member of the revolutionary rank-and-file union the Industrial Workers of the World (IWW) and was one of the leaders of the San Pedro dock workers' strike. In 1912 he was beaten up and permanently scarred during a free speech campaign in San Diego. Hill, left, was also a songwriter and his socialist songs appeared in the trade union newspapers, Industrial Worker and Solidarity. After his Red Songbook was published his songs were sung on picket lines and demonstrations. 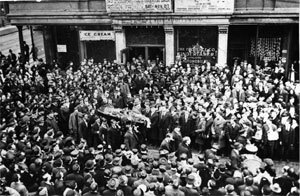 Songs such as The Preacher and the Slave (the phrase “pie in the sky” originates from a lyric in this song) and Casey Jones - The Union Scab became internationally known folk songs. When Hill's trade union activities made him a marked man and unable to find work in California, he moved to Utah. In 1913 it is believed Hill helped to organise a successful strike at the United Construction Company. During this dispute Hill stayed with some friends in Salt Lake City. While he was there, J. B. Morrison, a former policeman, was shot dead by two masked gunmen in his grocery shop. A few weeks before the murder, Morrison had told a journalist that he had recently been threatened with a revenge attack because of an incident while he was in the police force. On the night of the murder, 10th January, 1914, Hill visited a doctor with a bullet wound in his left lung. Hill claimed he had been shot in a quarrel over a woman. Noting that the bullet had gone clean through the body, the doctor reported Hill's visit to the police. They already knew about Hill's trade union activities and decided to arrest him. Hill refused to say how he got the wound. As a witness standing outside Morrison's store claimed that he heard one of the murderers say: "Oh, God, I'm shot." Hill was charged with the murder of Morrison. Leaders of the Industrial Workers of the World argued that Hill had been framed as a warning to others considering trade union activity. Even William Spry, the Republican governor of Utah admitted that he wanted to use the case to "stop street speaking" and to clear the state of this "lawless elements, whether they be corrupt businessmen, IWW agitators, or whatever name they call themselves"
At Hill's trial in Salt Lake City none of the witnesses were able to identify Hill as one of the murderers. The bullet that hit Hill was not found in the store. Nor was any of Hill's blood. As no money was taken and one of the gunmen was heard to say: "We've got you now", the defence argued that it was a revenge killing. However, Hill, who had no previous connection with Morrison, was found guilty of murder and sentenced to death. The IWW launched a campaign to halt the execution. Wobbly (IWW member) Elizabeth Flynn visited Hill in prison and was a leading figure in the attempts to force a retrial. In July, 1915, 30,000 members of Australian IWW sent a resolution calling on Governor William Spry to free Hill. Similar resolutions were passed at trade union meetings in Britain and other European countries. Woodrow Wilson also contacted Spry and asked for a retrial. This was refused and plans were made for Hill's execution by firing-squad on 19th November, 1915. When he heard the news, Hill sent a message to IWW leader Bill Haywood saying: "Goodbye Bill. I die like a true blue rebel. Don't waste any time in mourning. Organise." He also asked Haywood to arrange his funeral: "Could you arrange to have my body hauled to the state line to be buried? I don't want to be found dead in Utah." Hill’s last act before his death was to write the poem, My Last Will. Hill's ashes were put into small envelopes and on May Day, 1916, were scattered to the winds in every state of the union. This ceremony also took place in several other countries.